Colloquial name for a Jewish old-fashioned elementary school. The Talmudical expression "tinnoḳot shel bet rabban" (children, or, rather, babies, of the teacher's house; school-children) may indicate that the custom of giving instruction in the home of the teacher dates back to the early centuries of the common era. The ḥeder of Germany early in the last century, as described by Jost, differs little from the Russian and Polish ḥeder, except that boys and girls were seated together. There is little doubt that during the past centuries the ḥeder underwent but slight modification, and that its first radical modifications came when it began to give way to schools arranged more in accordance with the modern spirit. The typical ḥeder was held in the room, seldom large, in which the "rebbe" (corrupt form of "rabbi") and his family lived, and where he or other members of his household, often the "rebbitzin" (rabbi's wife), carried on other businesses or occupations to supplement the small income obtained from teaching. The hours of study were very long,sometimes beginning early in the morning and lasting, in the winter, to nine or ten at night. The youngest children were taken to and from the ḥeder by the "belfer" ("behelfer," or "assistant"), who usually maltreated them and ate part of the food which they took with them to school. In the ḥeder the children were divided into "kitot," or classes, and while the rebbe was teaching one class, a second class, at the same long table, was repeating ("ḥazern," from "ḥazor" = "to repeat") a different lesson; and as all pupils were required to read as loud as possible, yelling at the top of the voice being preferable, the clamor of the ḥeder could be heard far away, while the din inside was such that one person could hardly hear what the other was saying. The atmosphere of the ḥeder was unhealthful, as nobody cared for ventilation or for comfort; the time allowed for play was very brief; and vacations were given only in the months of Nisan and Tishri, the principal festival months. Various punishments were meted out to disobedient or inattentive children, and chastisement often meant cruel flogging; it is no wonder, therefore, that the ḥeder was to a very large extent a cause of physical deterioration, and that many remember with horror the school-days spent there. J. L. Gordon's semi-humorous description of his teacher Reb Todros, and of the armory of instruments of torture with which he enforced discipline and attention ("Collected Works," i. 112-113, Odessa, 1889), may be somewhat exaggerated, but in all essentials is, to a very large extent, true. This system of education was but slightly modified in the smaller cities of Russia by the advent of the Haskalah, or progressive movement; in the larger cities the change for the better became more marked in the present generation. While it is still true that the "melammed," as the teacher is called by everybody except his pupils, is usually an incompetent and often an ignorant man who has failed in every other occupation, there were always true rabbinical scholars in the profession; and many of the "maskilim," who were acquainted with modern ideas, attempted to introduce more recent methods when fate placed them in the ranks of the "melammedim." At the present time, and especially in the larger cities, the ḥeder has risen from its former low state. The "ḥeder metuḳḳan" (improved ḳeder) is a new institution that has appeared during the last few years, in which new methods of instruction have been introduced with varying success. Much is expected, but little has hitherto been accomplished, by the method known as "'ibrit be-'ibrit" (Hebrew in Hebrew), the translating of the Hebrew words of the Pentateuch or the Hebrew text-book by other Hebrew words, and not in Yiddish, as formerly. 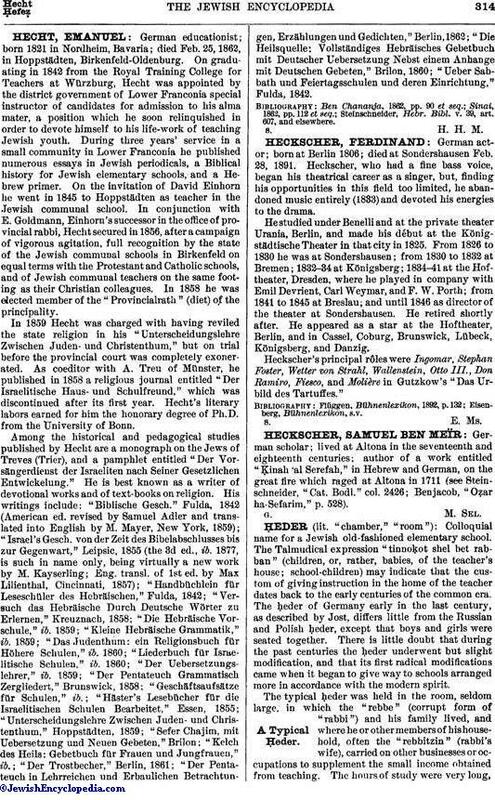 All improved methods of Jewish education naturally imply shorter hours and the inclusion of secular subjects, and consequently the new ḳadarim can not impart as much Hebrew and rabbinical information as was possible under the old régime, when the pupil was confined for about ten years from twelve to fourteen hours daily in the old-style ḥeder. The ḥeder which appeared in the United States with the advent of the Russian Jews is but a faint reflection of the original institution. The hours of study are short, the boys are not submissive, and the rebbe, who is in most cases unable to speak English, is more often a martyr than a tyrant. Some of the ḥadarim in New York are held in spacious rooms that are used for no other purpose, are furnished with the conveniences usual in modern schools, and are administered by learned and intelligent teachers. The proportion of ḥadarim held in small synagogues is much larger in New York than in Russia, because they are not in the way of the "baḥurim," or adults, who in Russia study at the synagogue or bet ha-midrash throughout the day. There is a considerable ḥeder, or, rather, anti-ḥeder, literature of the time when haskalah was propagated more zealously than now. Some excellent parodies, like Reuben Zimlin's "Haggadah le-Melammedim" (Odessa, 1885), portray the faults and the troubles of the melammedim, and give an idea of the low esteem in which they were held. 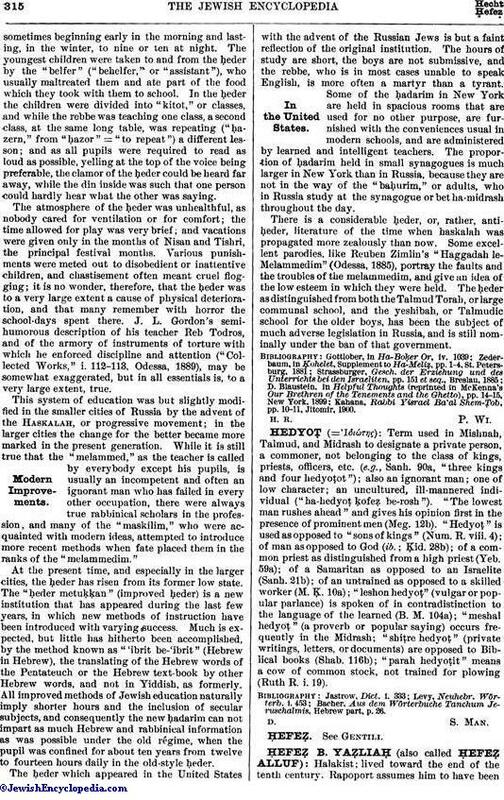 The ḥeder as distinguished from both the Talmud Torah, or large communal school, and the yeshibah, or Talmudic school for the older boys, has been the subject of much adverse legislation in Russia, and is still nominally under the ban of that government. Kahana, Rabbi Yisrael Ba'al Shem-Ṭob, pp. 10-11, Jitomir, 1900.